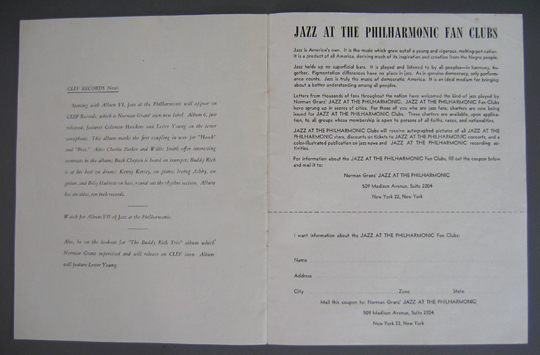 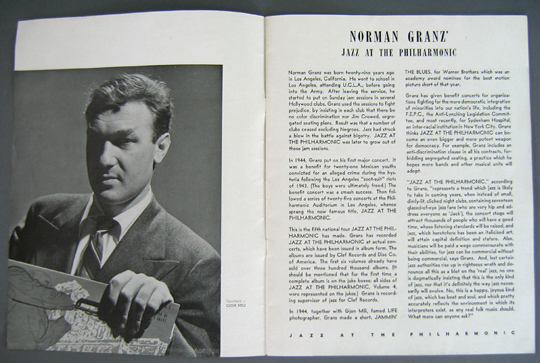 Jazz At the Philharmonic, Original Vintage Concert Tour Program, Fifth National Tour, Fall 1947, presented by Norman Granz. 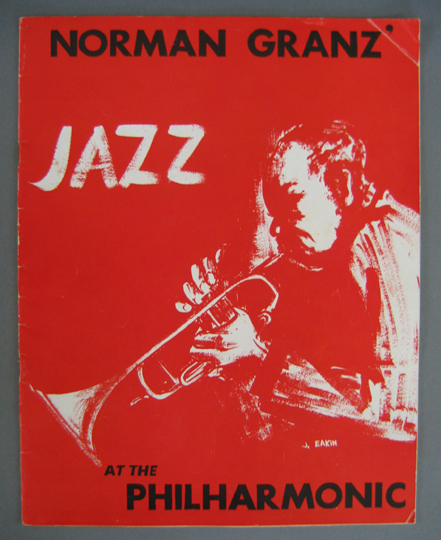 Beginning in July of 1944 Granz had staged a number of successful jazz concerts in his native Los Angeles at the Philharmonic Auditorium, and in the following year the budding young impresario took the show on the road. 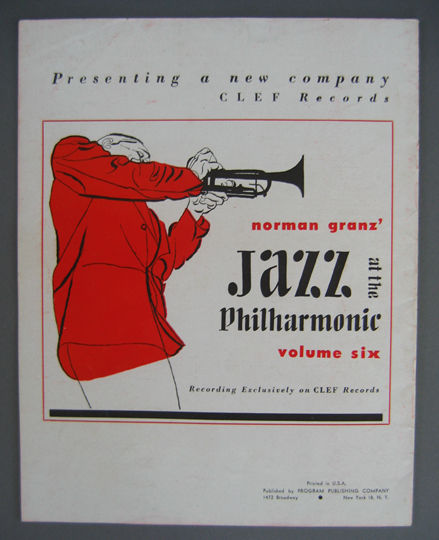 His inaugural National Tour in the Fall/Winter of 1945-46 marked the beginning of an extraordinarily successful venture, which in the coming decades would see the JATP concert tours extend to Canada, Europe, and the Far East, and in conjunction with his recording companies, Norgran Clef, and Verve, would make Granz the most successful and influential producer in jazz. 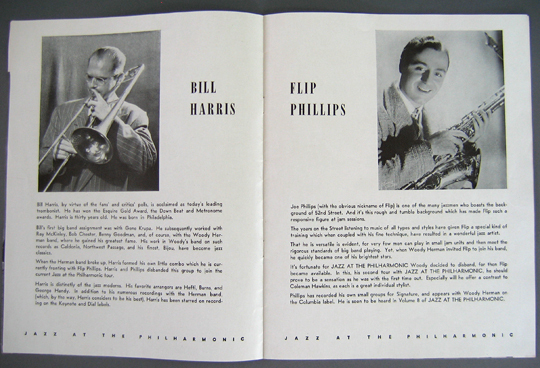 The Fifth Tour in the Fall of 1947, the second of two scheduled in that year, included saxophone luminary, Coleman Hawkins, already a veteran of the JATP cast, and tenorist Flip Phillips who would become one of the mainstays of the JATP tours, as well as poll-winning trombonist Bill Harris, bop trumpeter Howard McGhee and the wonderful jazz singer, Helen Humes. 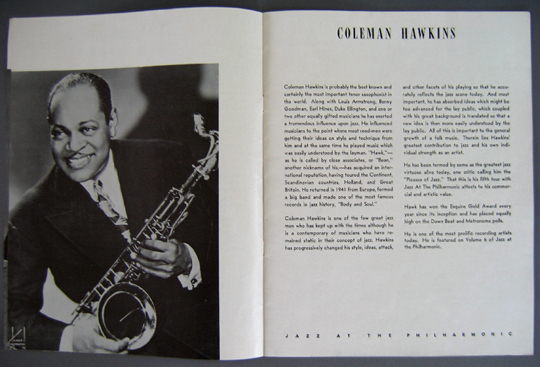 In original wraps, illustration of a trumpeter is by J. Eakin, a rare instance of a JATP program which does not feature the great David Stone Martin's cover art, although the rear wrap does feature DSM's iconic trumpeter logo. 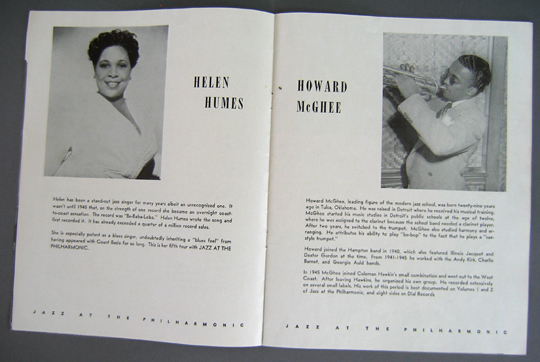 Very good++, tightly staple bound, 8.25" by 10.5" [16 pages], b & w photographs, shallow creases to the corners of front wrap, mild soiling to rear wrap, touch of rubbing to spine. 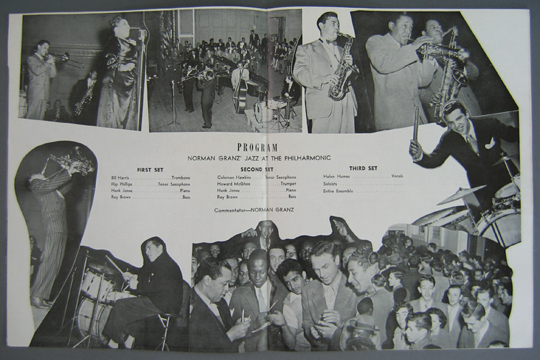 A vintage jazz collectible, original JATP programs from the 40's are now very scarce.